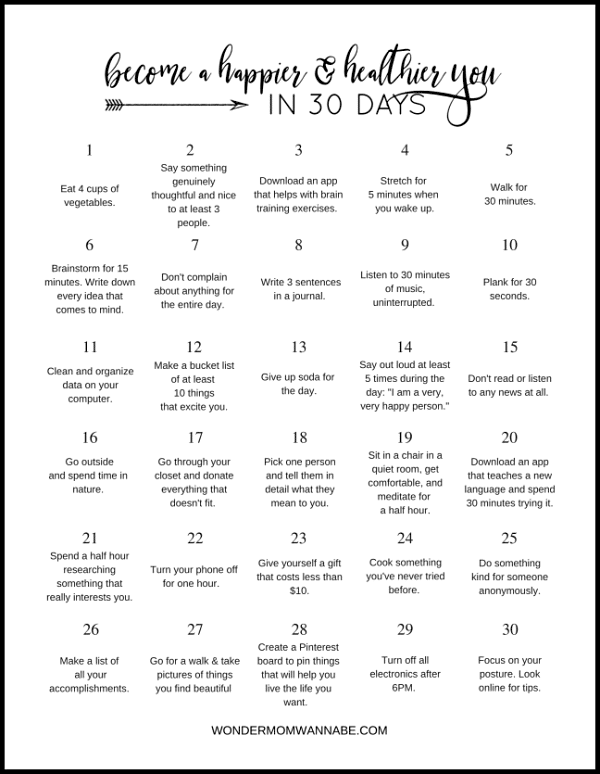 This 30-Day Challenge is designed to improve your physical, mental and emotional health with small, simple actions each day. Each day during the challenge, you’ll do one thing that makes you a healthier you. A lot of 30-day challenges focus on one specific area of your health. This focused approach can be really effective! I’m a big fan of breaking big challenges down into smaller, easier to accomplish goals. So, it makes sense to focus on something like drinking more water or exercising regularly in a 30-day challenge. In fact, whenever I slip into bad eating habits, I start a new round of Whole 30 to take back control over my food. Specific 30-day challenges are great when you know exactly what you want to improve. But when you’re feeling just an overall sense of dissatisfaction with your current status, sometimes it isn’t clear which single improvement will turn you around. That’s when a general 30-day challenge is ideal. Rather than narrowly focusing on something specific, you can enjoy some variety and freedom, while still working towards a larger goal. That’s exactly what this 30-Day Challenge for a Healthier You is designed to do — move you closer to overall health. 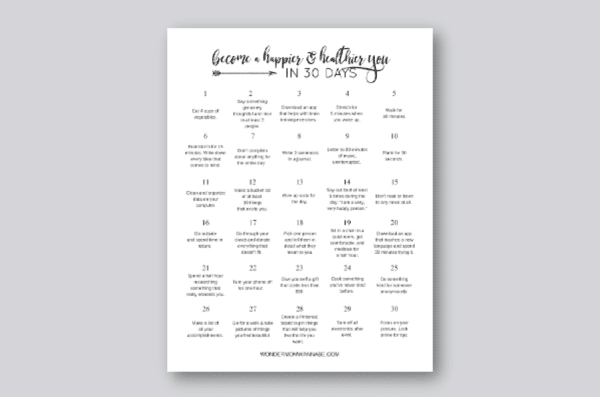 Each day in this 30-Day Challenge for a Healthier You involves a daily goal that will benefit either your physical, mental or emotional health. For example, the first day is a goal that improves your physical health — Eat 4 cups of vegetables. Then, on day 2, you’ll perform a task that feeds your emotional health — Say something genuinely thoughtful and nice to at least 3 people. On day 3 you’ll download an app that helps with brain training exercises to work on your mental health. The goals vary from day to day so that all month long you are working on all three aspects of your health each week. By the end of the 30 days, you’ll realize how easy it is to do one healthy thing each day. You’ll also know which health-improving tasks are easiest for you so that hopefully those will become a regular part of your life. The challenge days that are the most difficult for you will show you the areas of your health you need to focus on more. Don’t worry, we’re also going to talk about how to improve those areas after the 30-day challenge so you can continue to see great results long past the end of the challenge. 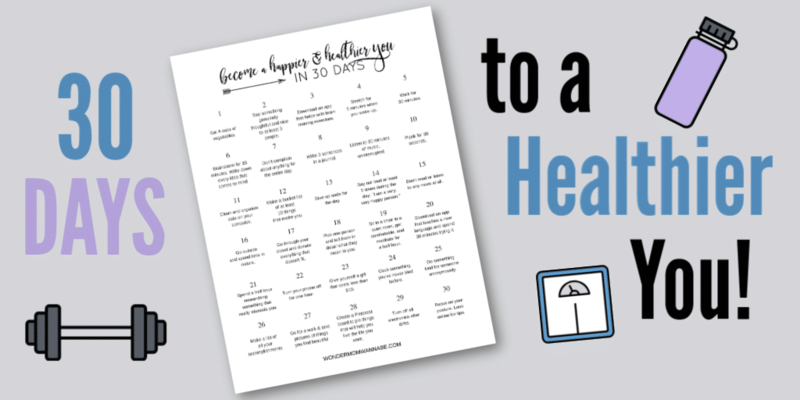 Ready to tackle the 30-Day Challenge for a Healthier You? Just click the image below to download and print the calendar. After you’ve finished all of the tasks in the 30-day challenge, you should have a good idea of which areas need more attention. If you didn’t have any trouble, that’s awesome! Making small strides toward better health is exactly the right approach for you. 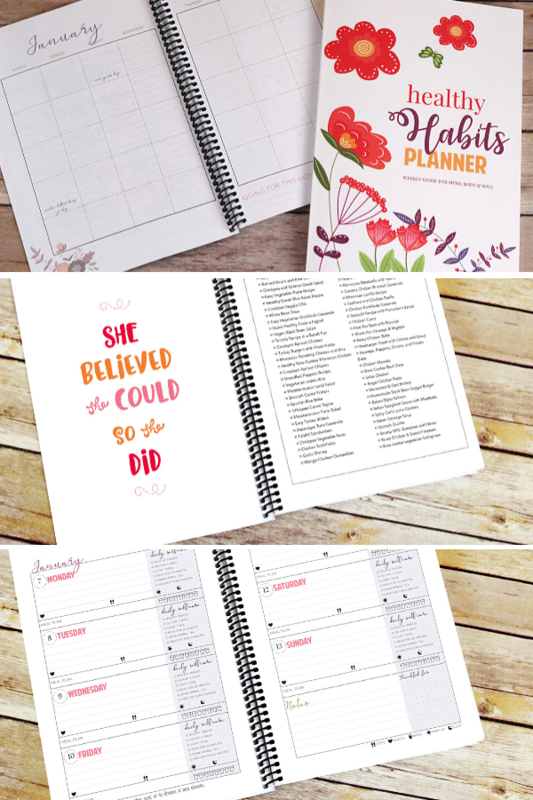 Also, consider getting the 2019 Healthy Habits Self Care Planner. It’s full of inspiration, ideas, and places to track your journey to a healthier you! If you struggled throughout the challenge, don’t feel defeated! You’re now armed with some great information. Depending on where you struggled, here are some resources to help you continue to improve. Congratulations! The simple act of reading this article has nudged you one step closer to a healthier, happier version of yourself. You’ve created a spark. Now use it to light a fire of motivation! Thank you for this! Especially at this time of year, I am more aware of my health issues, and I need to be more proactive! I love so many of these ideas! I can’t wait to try it. This is a great challenge for New Year’s Resolutions.